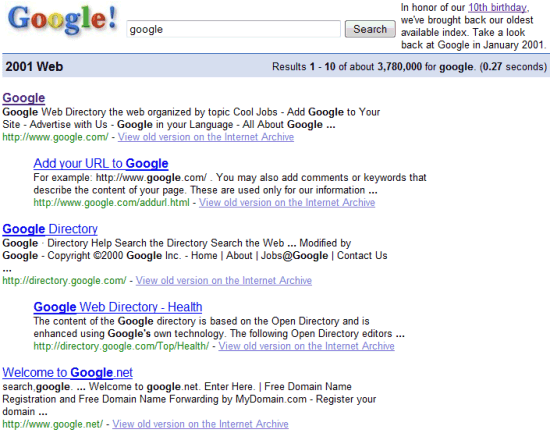 Google brought back the index from January 2001 to show how many things have changed in almost 8 years. At that time, Google's index included 1,326,920,000 web pages and it was the most comprehensive index of a search engine. 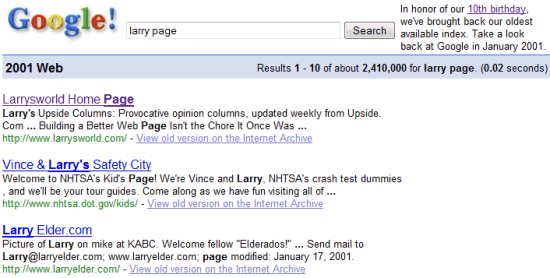 Google explains that the index from January 2001 is the earliest available. "Well, for various technical reasons that are too boring to go into, earlier versions of our index aren't readily accessible. But we did still want to offer users a chance to search an older index as a way of looking back at web history, and the January 2001 index is the best we can do." As Wikipedia informs us, January 2001 was an important month: Wikipedia is founded, George W. Bush becomes the 43rd President of the United States and Apple introduces iTunes. If you search for Google, you'll find references to very few Google services: Google Directory, Google Toolbar and specialized search engines for Apple, Linux, but not yet Microsoft. 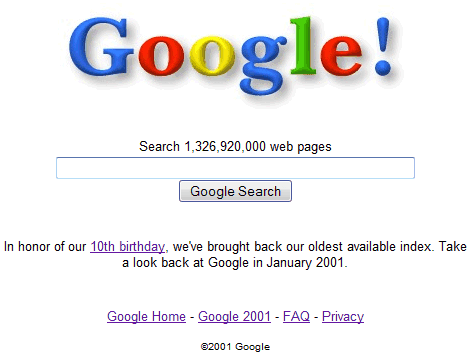 For more Google nostalgia, don't miss Google's special site for the 10th birthday. itself up for holidays), Google is a no-nonsense search tool." campaign, it has amassed a cult following." * "Over the last few days a subtle error on the part of our home's gateway to the Internet rendered Google inaccessible. I was in agony. I was unable to write reports and actually felt rather stupid without it. I then realized I had effectively undergone a temporary lobotomy: Google is a part of my brain." (more). * "Rather than trying to compete with portal sites for advertising dollars -- there is no banner advertising on its site -- Google is working toward improving its search technology and making money by licensing the technology and powering searches on other sites. In other words, Google is setting itself up as an Internet infrastructure company." * "Google is highly esteemed among hackers for its significance ranking system, which is so uncannily effective that many hackers consider it to have rendered other search engines effectively irrelevant." * "The idea behind Google is that traditional search engines are infuriatingly stupid. They think relevance is related to repetition. If you type a request for Tiger Woods, you'll get web sites listed according to how many times those words appear. That's no guarantee of quality and is open to abuse. If you have a Tiger Woods site for fans, just type his name into the source code thousands of times and search engines will list your site first. Consider the man-hours corporations spend on online research and multiply that by the increasing chaos of the Web and you see that millions of dollars leak out of the economy without productive benefit. My Google searching days began in 2002, 1 year into grad school (M.Sc. in Environmental Science). 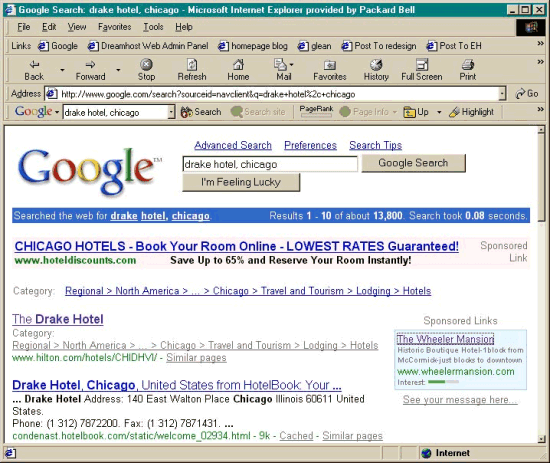 Serious use of Google products started in 2005. Its amazing how much Google has grown. Oh noez!! History tubez iz clogged! We unclogz quick.. pz try again, kthx! Back in the day, we had to search uphill both ways. Now that we've had a chance to catch our breath, try your search again. To verify that you're not a zombie robot from 2001, please type the letters you see in this box [HaPpY BiRtHdAy GoOgLe]: [input /] , then try again. Sorry, the series of tubes from 2001 is less robust than today's, and we have a clog. Please try again. Sorry, the space-time continuum is temporarily experiencing issues. Please try again later. Sorry, you're too short to go on this ride. You must be at least this tall to ride the Google time machine. Or try again. It turns out that you're less lucky than you feel. Please try again. The hamsters are dancing as hard as they can, but they're seven years older now! Please try again. Sorry, it turns out Y2K+1 was the real problem. Please try again. 2008 called, and it wants its query back. Please try again. Sure 1.21 gigawatts was easy to come by in 2001, but we've got an energy crisis now! Please try again. Unsupported browser. Please upgrade to IE4 (32 MB RAM recommended), or try again. Arrr! Belay that query, matey! Yer time machine caught a foul wind and blew ye to the wrong date! I dare ye t' try again. Sorry, in 2001, all our base were belong to them. Feel free to try again. I hear there's rumors on the internets that Google's 2001 servers are over capacity. Please try again. And too fun also while searching with names,blog names and all. Now if only i had made a google bomb back then... damn.